If you aren't familiar with the Ricky Gerard drama, the short is that the 3rd fittest man on the planet just got busted for taking a Euroball and was stripped of his title and has to return his winnings. 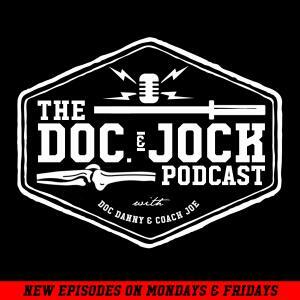 On On Episode 224 of the Doc and Jock Podcast we talk about should PED's in CrossFit. We debate the risk vs. reward. We talk if it actually helps and then debate the point that PED's SHOULD be allowed in CrossFit. From a fan's perspective it's a better sport if people can implement PED's in CrossFit. From an Athlete's perspective it would allow not only for a better performance, but also it may be safer? Huh you say? Yeah if an athlete is recovering better between events you'd see less injury, thus keeping the performers safer. Tune in to hear all the fireworks and also learn why Danny's go to move in a fight is a forehead kick.